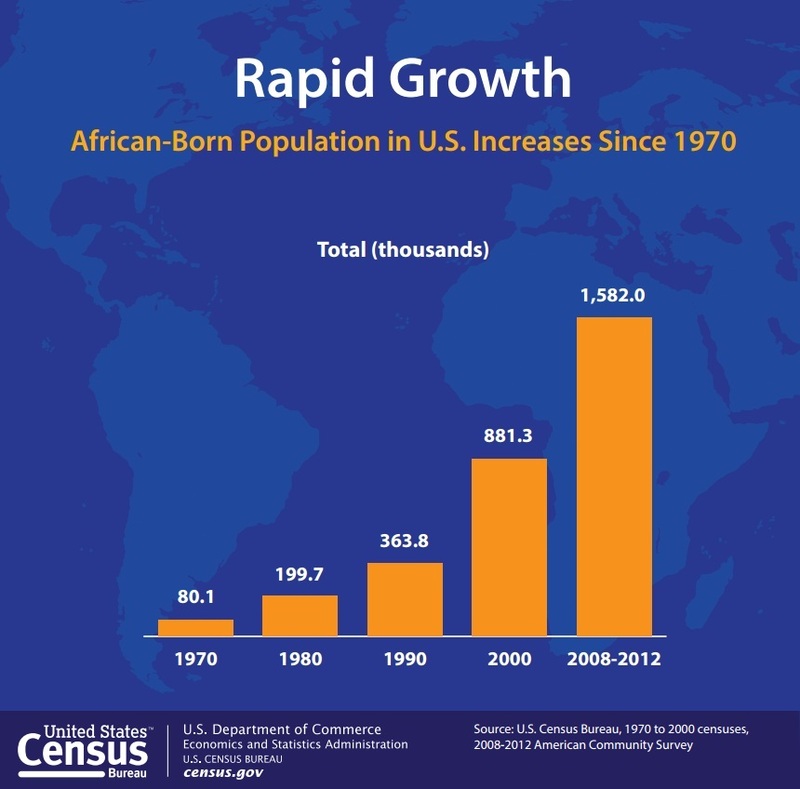 The foreign-born population from Africa has grown rapidly in the United States during the last 40 years, increasing from about 80,000 in 1970 to about 1.6 million in the period from 2008 to 2012. The population has roughly doubled each decade since 1970, with the largest increase happening from 2000 to 2008-2012. The foreign-born population from Africa had a higher level of educational attainment than the overall foreign-born population: 41 percent of African-born had a bachelor’s degree or higher compared with 28 percent overall. 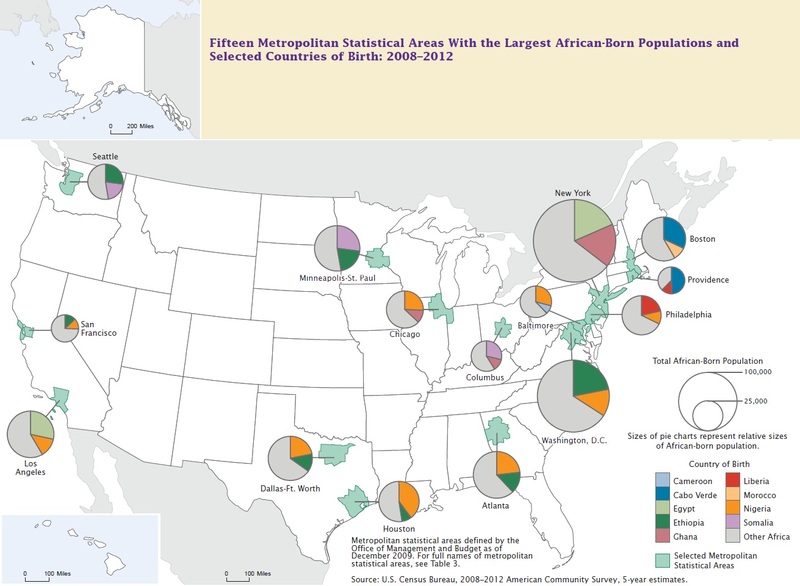 The Foreign-Born Population from Africa: 2008-2012, a brief based on American Community Survey statistics, shows that the African foreign-born population accounts for 4 percent of the total U.S. foreign-born population. No African country makes up the majority of these immigrants, but four countries — Nigeria, Ethiopia, Egypt and Ghana — make up 41 percent of the African-born total. The four states with African-born populations over 100,000 were New York (164,000), California (155,000), Texas (134,000) and Maryland (120,000). 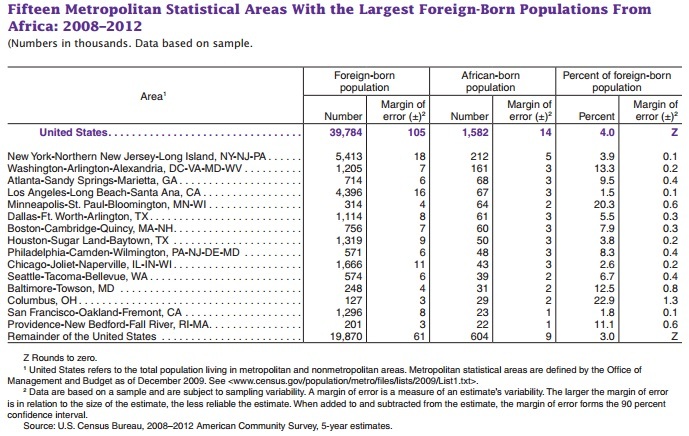 Of the 10 states with the largest African-born populations, Minnesota (19 percent), Maryland (15 percent), Virginia (9 percent), Georgia (8 percent) and Massachusetts (8 percent) had percentages of African-born in their foreign-born populations that were at least twice the national percentage of 4 percent. Metropolitan areas with the largest African-born populations were New York (212,000), Washington (161,000), Atlanta (68,000), Los Angeles (68,000), Minneapolis-St. Paul (64,000), Dallas-Fort Worth (61,000) and Boston (60,000). Among the 10 metro areas with the largest African-born populations, Nigerians were the most populous group and constituted a high proportion (20 percent or more) of the African-born in the Atlanta, Chicago, Dallas-Fort Worth and Houston metros. Similarly, Ethiopians were a high proportion and the largest group in the Washington D.C. metro, Cabo Verdeans in Boston, Somalis in Minneapolis-St. Paul, Egyptians in Los Angeles and Liberians in Philadelphia. Of the 1.6 million foreign born from Africa in the United States, 36 percent were from Western Africa, 29 percent were from Eastern Africa, and 17 percent were from Northern Africa, followed by Southern Africa (5 percent), Middle Africa (5 percent), and other Africa (7 percent) by over 700,000 persons, up from a total of 881,300. Over 490,000, or about 70 percent of that growth, has been from countries in Western and Eastern Africa. 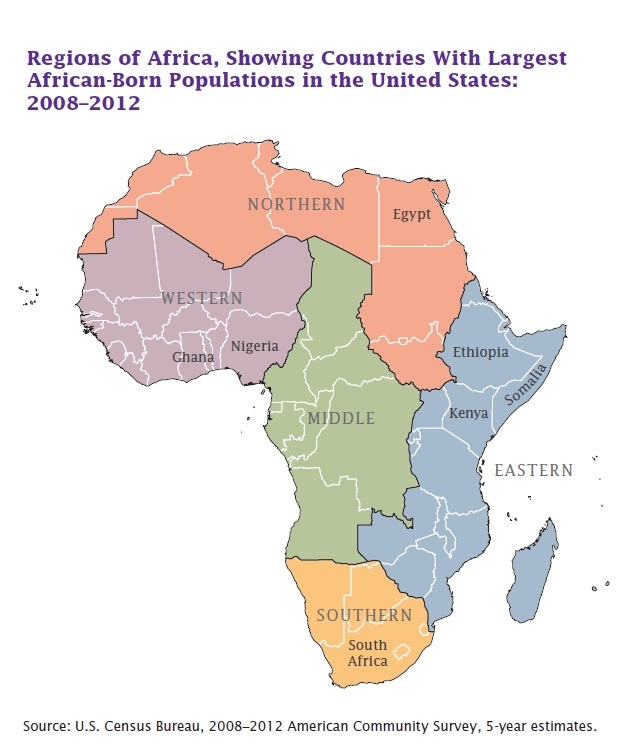 The largest African-born populations were from Nigeria and Ghana in Western Africa; Ethiopia, Kenya, and Somalia in Eastern Africa; Egypt in Northern Africa; and South Africa in Southern Africa. Of these seven, the four largest were Nigeria (221,000 or 14 percent of the African-born population), Ethiopia (164,000 or 10 percent), Egypt (143,000 or 9 percent), and Ghana (121,000 or 8 percent), together constituting 41 percent of the African-born total.